Paul and Corie Bratter — newlyweds in every sense of the word — move into a cramped 6th-floor Manhattan walk-up after a passionate six-day honeymoon. Impulsive and free-spirited, Corie is the opposite of Paul, a straight-as-an-arrow young lawyer struggling to prove himself in his new career. Eccentric neighbors, an Albanian dinner party, too much Greek uzu, and Corie's antics playing matchmaker lead to trouble in paradise in this fast-paced witty comedy by acclaimed playwright Neil Simon. 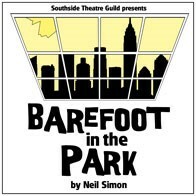 Barefoot in the Park (Neil Simon) is presented by special arrangement with SAMUEL FRENCH, INC.